The Human Rights Center offers competitive fellowships for law students to take summer placements in the field of human rights and international law. The program ensures students get hands-on training and experience in the field while also supporting high-impact organizations. Students apply to the program for funding to support unpaid human rights internships they have secured for themselves or they can apply for one of the funded placements arranged by the Human Rights Center. November 14, 2018, 5:00 p.m. Deadline to apply for the HRC-sponsored positions with the ECCC and the OHCHR. February 11, 2019, 5:00 p.m. Deadline to apply for the HRC-sponsored positions with the Advocates - Cooper fellowship and the International Institute of Humanitarian Law. Deadline to apply for early consideration for funding of an independent placement. March 29, 2019, 5:00 p.m. Deadline to apply for a fellowship award to support an independent placement. Download the 2019 information and 2019 application form. We encourage interested students to reach out to Human Rights Center faculty, staff, and past fellows, to discuss possible placements related to your qualifications and interests. To receive our bi-weekly mailing with opportunities in the human rights and international law field, including many posts for summer internships, send a request to humanrts@umn.edu. Read about the work of our 2018 Fellows. Since 2013 UMN Professor Laura Cooper and her husband Mr. Benjamin Cooper have generously offered the Cooper Fellowship for UMN law students to work with the Refugee & Immigrant Rights Program at The Advocates for Human Rights. We are especially honored to host this fellowship given Prof. Cooper’s importance to the Law School. Professor Laura Cooper retired in 2018 and was the first female law professor and first woman to receive tenure at the Law School. She is a renowned expert in the fields of labor law and workplace dispute resolution and beloved teacher in her courses and the innovative capstone that she designed. She is a distinguished scholar who has contributed her knowledge in the courses she and the capstone course she designed. Her work centered on the perseverance towards equality of women in higher education. Her repertoire includes work with the Minnesota Supreme Court and the United States Court of Appeals for the Eighth Circuit regarding gender fairness and equality in courts. In his own right, Ben Cooper is a mathematics professor at Augsburg College and a very talented musician. The HRC is so pleased to partner with Prof. and Mr. Cooper in their goal to support the work of the Advocates and to make an important impact on the lives of students in the human rights field. The Dobias Human Rights Fellowship enables UMN law students to pursue hands-on experience as young lawyers fighting for justice in the context of mass atrocity, working in international criminal law, and in pursuit of corporate accountability for human rights abuses. Law School alum Mr. William Drake established the Fellowship in honor of a Premysl (Prem) Josef Dobias and his wife Hana. Prem was a lawyer from Czechoslovakia. Although Prem was not Jewish, during the Holocaust he joined a resistance group that smuggled Jews through Slovakia and Hungary to safety in Italy. Eventually he was captured and sent to Mauthausen, a concentration camp in Austria. Prem endured great suffering but benefitted from the fact that he spoke seven languages and was useful as an interpreter. On May 5th, 1945 Mauthausen was liberated and for the rest of his life, Prem actively contributed in a variety of ways to the preservation of historical memory and the pursuit of justice following his liberation. By great chance, Prem and Hana were Bill Drake’s landlord in London while Bill was studying at the London School of Economics and they became great friends. The Human Rights Center is very pleased to be able to part of this generous and impactful way of honoring a great man and family. Ms. Nazie Eftekhari established this fellowship to honor her father’s life-long work in the field of human rights. Mr. Mehdi Eftekhari was an Iranian lawyer who moved to Minnesota in 2000. After a long career in public service, he spent his time in Minnesota working to advance children’s health in Iran. His family remembers his commitment to human rights and humility, education, and kindness. The Heins & Mills Human Rights Fellowship was established in 2007 to support summer placement opportunities for students hoping to gain hands-on experience in the field of human rights and international law. Ambassador Samuel D. Heins and Stacey Mills are both accomplished human rights lawyers. Heins, a University of Minnesota Law School graduate, has been a leader in the Twin Cities human rights community for decades. Namely, he was one of the original founders of the organization now known as the Advocates for Human Rights and helped found the Center for Victims of Torture. Stacey has long served in the leadership of Planned Parenthood. Together, they continue to build a legacy of public service and human rights work in Minnesota by supporting the next generation of human rights lawyers. The Kraig Larson Human Rights Fellowship was established in 2012 to allow students to pursue formative internships in the field of international human rights law. Mr. Larson was one of our first Human Rights Center Fellows in 1991 as an undergraduate student considering attending law school. He was greatly impacted by the experience and inside look into human rights advocacy that he received while interning with the renowned International Service for Human Rights in Geneva. After graduating from the University of Minnesota, he became a founding partner Ciceron, a Minneapolis-based marketing firm that specializes in digital marketing, advertising and design. He also works with programs aimed at making the marketing industry more accessible to students of color and students facing economic barriers. The Human Rights Center is proud to have Mr. Larson as an alum and partner. The George Ludcke/ Class of ’78 Human Rights Fellowship Fund supports UMN law students working for the summer in the areas of environmental rights, disability rights, children’s rights, and other social concerns. Ludcke, who graduated with the University of Minnesota Class of 1978, was a dedicated volunteer lawyer at the Children’s Law Center of Minnesota and worked in the Sierra Club Environmental Law Program as well. When he passed away suddenly in 2008, his family, classmates, and colleagues established an annual Human Rights Fellowship in his honor. The Class of 1978 continues to support this important fellowship for promising new attorneys committed to social justice. Since 2014, the students of the University of Minnesota Law School have benefited from the Frank C. Newman Fellowship through the Human Rights Center. This gift honors the close professional and personal relationship of Professor David Weissbrodt and Professor Frank C. Newman and the desire of the family to continue investing in talented and committed students learning about international human rights law. Frank Newman, a legend in the field of human rights and international law, served as the Dean of University of California-Berkeley School of Law and Associate Justice of the Supreme Court of California. He was also the professor and mentor of our own Prof. David Weissbrodt, Regents Professor at the Law School and founder of the UMN Human Rights Center. The Human Rights Center is very honored to have a summer fellowship in honor of Frank C. Newman, made possible yearly by his family through his daughter Holly. For more than 10 years, the Human Rights Center has been proud to offer annual Mansfield-Meron Fellowships. Anne Mansfield-Meron (1912-1999) was a dedicated social activist and philanthropist. While working in the Chicago garment industry in the 1920s and 1930s she helped organize the Ladies Garment Workers Union in Chicago. As she grew older, her philanthropic work helped support social justice initiatives within her hometown of Chicago and later expanded to establish the Albert and Anne Mansfield Institute for Social Justice at Roosevelt University in 1999. The Mansfield Foundation has been a loyal supporter of Human Rights Center fellowships in her honor. 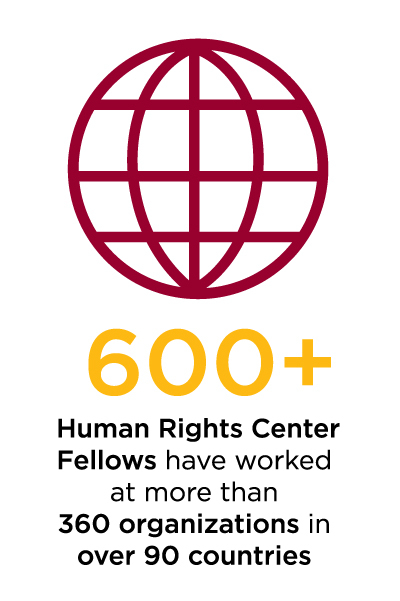 For more than 10 years, the Human Rights Center has been proud to offer the Saeks Public Interest & Human Rights Fellowships to top UMN law students. Allen is a 1956 graduate of the Law School and former Senior Counsel and a retired MSBA Senior Certified Civil Trial Specialist at the law firm of Stinson Leonard Street. Allen and Linda are generous supporters of the public interest programming at the Law School and both have storied careers in service of the community. Over the years of support to the HRC Fellowship Program, the Saeks have supported students working in a wide variety of public interest placements locally and internationally. Where have students worked in past years? Below is a selection of organizations that have hosted Human Rights Center Fellows in the past. See a full list of host organizations. These fellowship awards are available for University of Minnesota Law Students that are in their first, second, or third year of study. For exceptionally strong candidates, funds may be available for Law Students from other nearby Law Schools or undergraduate or graduate students from other disciplines at the University of Minnesota. Please feel free to contact the Human Rights Center if you would like to discuss your eligibility. What counts as a “human rights placement”? The Human Rights Center aims to support those internship experiences that will contribute to preparing future lawyers with the commitment and skills to defend human rights in the course of their professional trajectory. Past Fellows have worked at local, national and international organizations and have engaged in a wide range of human-rights related work, including work with: UN bodies, with national and sub-national courts and governmental agencies in the US and other countries, legal and advocacy support to grassroots organizations and campaigns, applied research with academic institutions, positions with US or foreign human-rights NGOs working at the national and international levels, and clerkships with organizations focused on client-based services as well as those doing strategic litigation aimed at impact for systemic change. The Fellowship Program has supported students and organizations working on a broad range of issues—prisons, immigration and asylum, poverty, environment, indigenous peoples’ rights, rights of women, transitional justice, rights of children, food and water, housing, torture, corporate accountability, rights of LGBTI persons, and much more. See the 2019 Human Rights Fellowship Application Guidelines. Are there any special considerations for international posts? All Human Rights Fellowship awards for international travel are contingent on compliance with the University of Minnesota’s health insurance requirements. You are responsible for coordinating with your host organization to ensure that you comply with all necessary immigration and visa requirements of the country. If you are a University of Minnesota student traveling to a country or location designated as Level 3 or 4 by the U.S. State Department, your award will be contingent on your receiving permission through the International Risk Assessment and Advisory Committee (ITRAAC) to travel from the University of Minnesota. Please do not apply for ITRAAC permission to travel until you have received confirmation of your award.